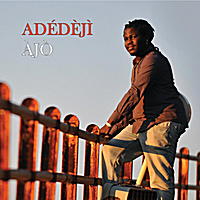 It's appropriate that the title of singer/songwriter Adedeji's new album, "Ajo," means "journey" when translated in English. After all, Adedeji's life has mostly been a journey, even musically. Adedeji doesn't let stylistic borders limit his creative vision; "Ajo" has a wildly open-minded scope, absorbing jazz, folk, and world music. According to Adedeji, much of it is due to his upbringing as his parents were quite diverse in their tastes. "The sound at home was a big part," Adedeji revealed. "My mother was more into local music while my father was on the classical side. I was in my mother's church choir but after rehearsals I would go and check my father's choir. I discovered jazz later in the late '90s, and I loved the energy. I discovered Afro-Cuban music the same period, and the rhythm was almost similar to what I grew up with so I connected naturally with it. I just couldn't stay with one style because all of these influences are running in my head. It would be unfair for my soul to stick to one." Adedeji was born in West Africa; however, like his genre-bending music he didn't remain within its boundaries, spending significant time between the Netherlands and Greece. Nevertheless, "Ajo" has its heart in Adedeji's African roots as he began recording the LP in Nigeria five years ago. Of his homeland, Adedeji sees the same kind of commercialization that often defines pop music in the West. "The true artistic essence seems to be dying," Adedeji observed. "There should be more focus on creative development. Also, there are a lot of styles and artists that have either not been discovered yet or have been ignored. Things have changed now. When I was younger, there was more originality and people pushing their limits; everybody sounded different but now they all sound Auto-Tuned apart from a few ones." Current trends have no impact on Adedeji's music, which is free from financially driven compromises and has ambitions that are quite pure. "My goals for the future as a musician would be to close gaps between genres and bring people together," Adedeji, who recently hired Los Angeles-based Wavelength Radio Promotion (http://www.wavelengthradiopromotion.com) as a publicist, explained. "I cannot be caged in a box of this style or that style. I also want to educate people from my side of the world, and above all, be truthful to the artist within me."